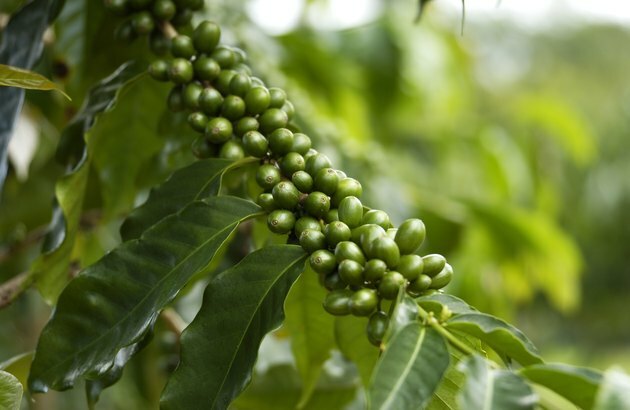 While traditional black coffee is made from roasted coffee beans, green coffee beverages are made using the unroasted, or "green," coffee beans. Extracts from green coffee beans have demonstrated many health benefits in scientific studies. The main components of green coffee responsible for these benefits appear to be caffeine and chlorogenic acid, a type of antioxidant, although some effects are influenced by factors other than these compounds. According to a study published in March 2006 in "BMC Complementary and Alternative Medicine," daily supplementation of an extract prepared from green coffee beans reduced body fat and body weight in mice, as well as fat composition in the liver. The effect was similar in mice supplemented with isolated chlorogenic acids and caffeine, which suggests that these are the compounds responsible for the effect. Chlorogenic acids found in green coffee can be digested and absorbed by humans, which implies a similar availability as the extract. In addition to its effects on promoting weight loss, chlorogenic acids in green coffee can reduce blood pressure. According to a study published in 2006 in "Clinical and Experimental Hypertension," patients supplemented with 140 milligrams of green coffee bean extract per day demonstrated reduced blood pressure throughout the study. No side effects were reported, which suggests that green coffee is a safe way to help reduce high blood pressure. The caffeine found in green coffee has a positive effect on your mood and brain activity. According to a review published in February 2008 in "Nutrition Bulletin," several studies have confirmed that caffeine can improve reaction time, vigilance, memory, alertness, focus, fatigue resistance and other factors of cognitive performance. Reviewers found the optimal intake of green coffee to be between 38 to 400 milligrams per day, or between approximately 1/3 cup to four cups of brewed coffee. Green coffee beans and their derived products contain multiple antioxidants, which are compounds that reduce the effects of cell-damaging free radicals in the body. This preventative function keeps you healthier by reducing the amount of damage and stress your cells can take. According to a study published in July 2004 in the "Journal of Agricultural and Food Chemistry," chlorogenic acid antioxidants in green coffee beans could prevent the proliferation of four kinds of cancer cells, suggesting green coffee may be useful in preventing some types of cancer.